No sign up required. Just show up on Saturday, February 23. Join Friends of Five Creeks planting natives along Codornices Creek, Berkeley’s and Albany’s only steelhead stream. Besides adding beauty, we’ll be increasing increase diversity and create welcoming habitat for birds and insects (food for fish). 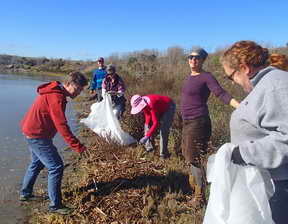 We’ll also remove invasives and pick up any litter. You’ll learn about the history of this creek, and progress toward making it the urban oasis for people and wildlife that it should be.